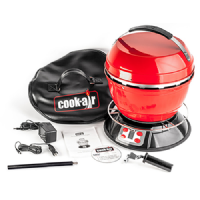 The Cook-Air grill is probably the most powerful portable grill on the market. And is so easy to use. Simply ignite an all natural, chemical-free fire starter and place it in the fire pot. Add one piece of hardwood - ideally, a Cook-Air wood puck. Then start your Cook-Air. The 5-speed fan will create air flow which will feed the fire and generate incredible heat in less than 5 minutes, attaining temperatures over 595°C at maximum power. True meat-searing power! But with 5 different settings, you can do almost anything from regular grilling to adding a final touch of smoke to foods at the end of their cooking cycle. • Top quality porcelain coated steel. • Inner parts made with 304 stainless steel to sustain intense heat. 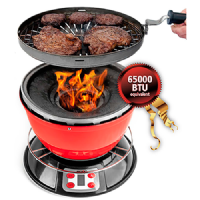 • Most powerful PORTABLE GRILL on the market. • Reaches temperatures of 595°C. • Cooking surface: 35cm dia. (3-4 rib-eye steaks). • SAFE. No explosive fuel or propane. • ECOLOGICAL. Burns 99.6% of its gases. • FAST. Ready to cook in 5 minutes. • Uses WOOD as fuel. • ADJUSTABLE HEAT, 5-speed fan. • EASY TO CARRY. Weighs less than 8kg. • Base remains cold. Can be used on most surfaces. • Take care. Sides and lid will get hot. • Controller and fan use 8x “D” batteries (c. 20 hours use), or a 240v adaptor, or car adaptor. CLICK THE VIDEO TO SEE HOW THESE AWESOME GRILLS COOK UP A HEAT!